OnePlus series phones such as Oneplus 6T, 6, and upcoming OnePlus 7 offer flagship smartphone experience at extremely reasonable prices. OnePlus phones including 6T, 6, 5T & 5 come with a unique DashCharge (5 Volts @ 4 amps) fast-charging wall charger. Even though, Oneplus phones DO NOT support USB-C PD charging or Quickcharge. However, still USB-C PD or Quickcharge powerbanks are better option for OnePlus phones as the QuickCharge or PD powerbanks these days cost almost same and get fully charged in one-half to one-fourth of time taken by regular powerbanks. Here is our selection of best portable chargers for OnePlus phones on the basis of criteria including power output consistency and quality, features, charging times of powerbanks, etc. Anker’s PowerCore II Slim 10000 is our top favorite powerbank for Oneplus phones. This powerbank offers excellent build quality in a slim handy design and gets charged quickly in 5 hours with low-cost Quickcharge wallchargers and charges Oneplus phones including the latest Oneplus 6T and OnePlus 6T Mclaren Edition at fastest possible 2 amp charging speeds. PowerCore II Slim 10000 is just .6 inches thick making it Anker’s slimmest 10000mah powerbank. It is also quite light at 7-oz and comes in a very pocket-friendly package. 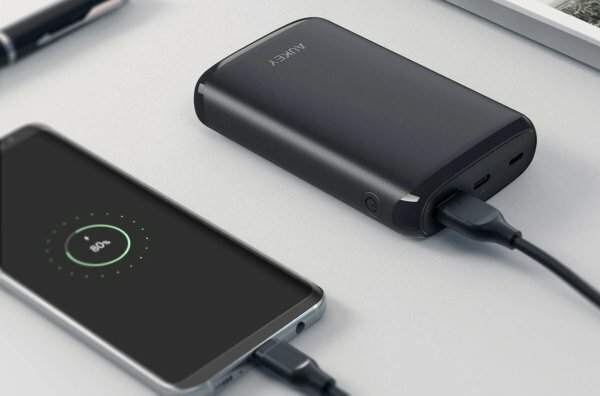 This portable charger will charge OnePlus 6T and 6 from 20% to 100% twice. The charging speed is about 1% per minute till 60% (zero to 50% in 50 minutes) for OnePlus 6 and zero to 50% in about 1 hour for Oneplus 6T. This powerbank is best charged with a Quickcharge wall-charger such as a Samsung S9/S10/S8 stock wall charger or LG/Sony/Xiaomi phone wall chargers. We do not recommend using the Oneplus DashCharge or WarpCharge wall chargers to charge the PowerCore II slim 10000. PowerCore II Slim 10000 will fastcharge latest Samsung phones including S10,S10 Plus S9, Note 9, S8 etc. at maximum possible speed (18watt or 0 to 50% in about 30 mins). It will charge iPhones at 2.1 amp charging speed (zero to 50% in 40 minutes for iPhone 8). Will charge all latest OnePlus phones at fastest speed that is possible with a non-Dashcharge powerbank. Currently, there are no good DashCharge powerbanks in the market. Any Quickcharge wall charger such as Samsung S9/S10/S8 stock wall charger will charge it in 5 hours. A USB-C charging port for charging would have been better as USB-C is becoming a standard these days and most new Android phones come with USB-C wall chargers. 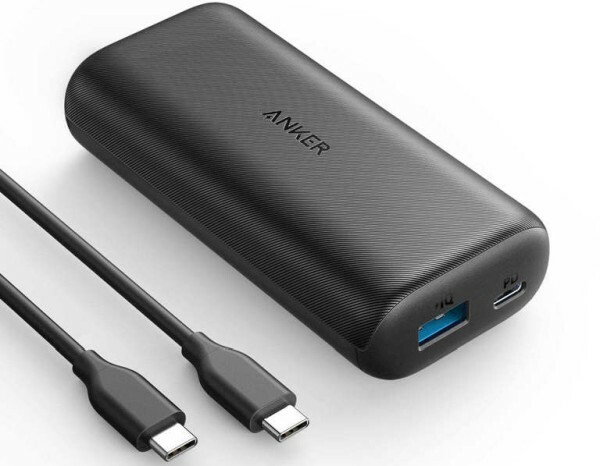 Anker PowerCore 10000 PD is our next top pick portable charger for Oneplus phones. The unique feature of PowerCore 10000 PD is that it has USB-C PD input and output. This makes it future-proof and maximum compatible with all latest Androids and iPhones. This portable charger will get charged in an incredible 3.5 hours with any USB-PD wall charger and in about 5 hours with Quickcharge wallchargers such as S9/S8 wall chargers. PowerCore 10000 PD will charges latest Oneplus phones including the Oneplus 6T and OnePlus 6T Mclaren Edition at fastest speed (2.0 amps) that is possible with a non-Dashcharge powerbank. PowerCore 10000 PD comes in anew 4.5 x 2.5 x 1inch new design that makes it more grippable and pocketable than older Powercores. The portable charger weighs just 6.8 oz and is easily the lightest PD powerbank in the market. Being a 10000 mah powerbank, this powerbank will charge OnePlus 6T and 6 from 20% to 100% twice. Its charging speed of 2 amp for Oneplus phones leads to charging time of about 50 minutes for zero to 50% and about 1 hour for zero to 50% for Oneplus 6T. Again, we do not recommend using Oneplus DashCharge or WarpCharge wall chargers to charge this portable charger . 18-watt USB-C PD support means that PowerCore 10000 PD will fast-charge latest Samsung phones including S10,S10 Plus S9, Note 9, S8 etc. (15-watt or 0 to 50% in about 35-40 mins). It also fast-charges latest iPhones Xs, Xr, XS Max, 8, 8+, at fastest possible speeds (zero to 50% in 30 mins). USB-C PD wall charger will fast-charge it in 3.5 hours. Aukey’s recently released powerbanks Aukey 10000 PD and Aukey 20000 PD are our top picks as value for money powerbanks for latest Oneplus phones. Both these powerbanks offer a unique combination of features and charge Oneplus phones including latest Oneplus 6T and OnePlus 6T Mclaren Edition phones at 2 amp charging speed (about zero to 50% in 1 hour for OnePlus 6T). A unique feature of these powerbanks is that these can be charged with 3 kinds of ports (Apple Lightning, USB-C and micro-USB). This allows maximum possible flexibility while charging the powerbanks. Also both can be charged rapidly with two kinds of fast-charging technologies – USB-C PD and Quickcharge 3.0. This allows you to use either USB-C PD wall chargers to charge the powerbank in 3.5 hours or a Quickcharge 3.0 wall charger (as well as S9/S10/S8/Note 9/8 chargers to charge the powerbank in 5 hours. This flexibility also extends for Output as well. 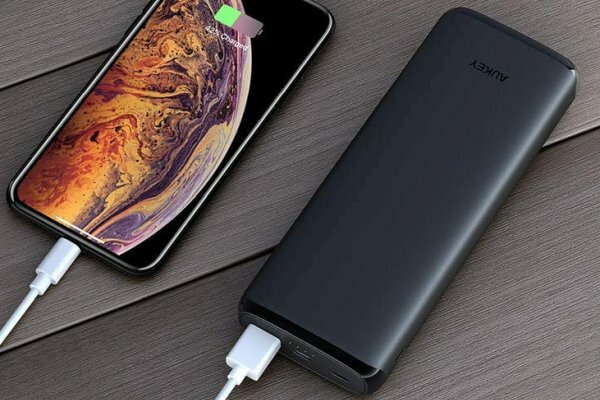 As Aukey 10000 PD and Aukey 20000 PD support both 18-watt USB-C PD output and 18-watt Quickharge 3.0 output, you can fast-charge almost all Android smartphones including S10/S9/S8/LG G7/ Pixel 3/XL/ etc. and also fast-charge all latest Apple iPhones including iPhone XR, Xs, Xs Max, X, 8 (or 0 to 50% in about 30 mins). Like all true 10000 mah wall chargers Aukey 10000 PD and Aukey 20000 PD will charge OnePlus 6T and 6 from 20% to 100% twice. We do not recommend using Oneplus DashCharge or WarpCharge (that comes with 6T Mclaren Edition) wall chargers to charge either Aukey 10000 PD or Aukey 20000 PD . Extremely reasonable price – same as Non-PD powerbanks. Charges OnePlus phones at max speed possible with a non-Dashcharge powerbank. No good DashCharge powerbanks currently available in the market. Quickcharge wall charger such as Samsung S9/S10/S8 wall charger will charge it in 5 hours. Can be charged in 3.5 hours with 18-watt USB-C PD wall chargers. Can also be charged with Apple iPhone wall chargers (Lightning input). 1-inch thickness. Slim design would have been better. 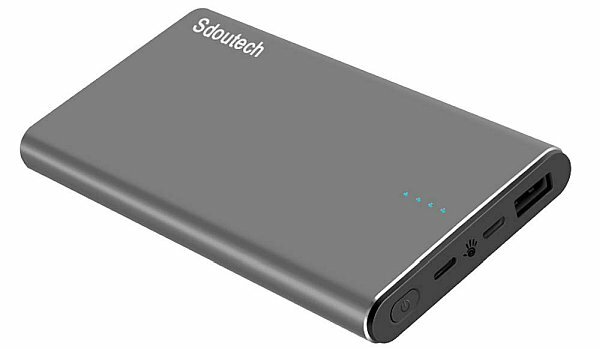 Sdoutech 10000 Slim Dashcharge Powerbank is currently the only decent quality powerbank available in US conveniently that supports DashCharge fast-charge powerbank for latest Oneplus phones. Sdoutech 10000 Slim Dashcharge Powerbank fully charges OnePlus phones from zero to 60% in 30 minutes and fully in about one hour. This powerbank has a slim 14mm thick (.6 inches) design and can be charged by both micro-USB and USB-C cables. Sdoutech 10000 Slim Dashcharge Powerbank will get fully charged in about 7 hours with any Quickcharge or 2.4 amp wallchargers. The portable charger weighs about 8.4-oz (238 gm) which is not exactly the lightest but still acceptable given the DashCharge feature. 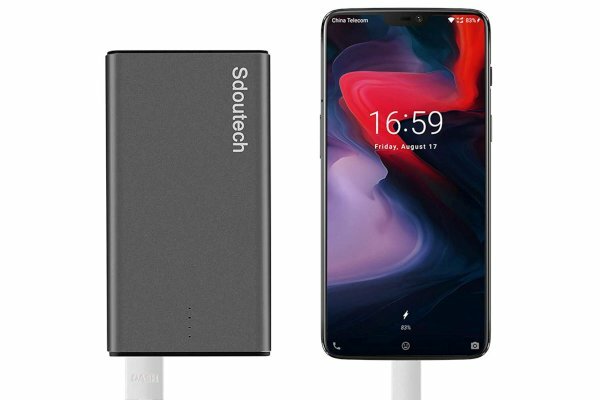 Sdoutech 10000 Slim Dashcharge Powerbank will charge OnePlus 6T and 6 from 30% to 100% twice. The powerbank is best used to charge from lower battery levels ( from 10-20% ) as Dashcharge charges at best speeds below 70%. Even though Sdoutech 10000 Slim Dashcharge Powerbank charges at Dashcharge speeds, it does not get charged via Dashcharge and we do not recommend using the Oneplus DashCharge or WarpCharge wall chargers to charge it. Sdoutech 10000 Slim Dashcharge Powerbank will charge phones other than OnePlus phones such as Samsung/LG/OnePlus/Pixel Android phones and OnePlus Android phones at 2 amp charging speeds (about 0 to 50% in 45-60 minutes more most phones). The only decent quality DashCharge powerbank in the market – Fastest possible charging powerbank for OnePlus phones including 6T, 6, 5, 4, 3T etc. Charges nearly as fast as stock Oneplus DashCharge wall chargers. A bit inconsistent due to less-than-ideal build quality. DashCharge works well most of the time but not always. Still by far the fastest charging powerbank available for Oneplus phones and is well worth it considering all pros and cons.